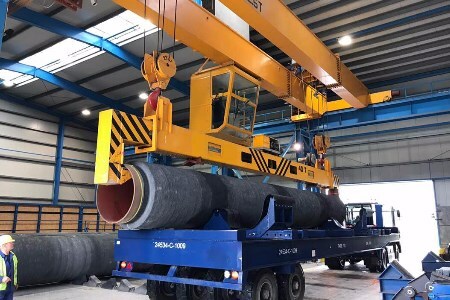 Nord Stream 2 contractor, Wasco Coatings Germany, has begun concrete weight coating pipes for the project in the port of Mukran on the Baltic Sea island of Rügen. Up to 90 000 pipes will be coated by the end of 2018 at the location, which is once again the logistics hub for pipeline construction after filling that role for the existing Nord Stream pipeline. Currently 39 000 pipes are already at a specially prepared storage area after being transported there from the Europipe factory in Mülheim an der Ruhr beginning in October 2016. "Concrete weight coating begins for Nord Stream 2 pipes"
Since contractually taking over the existing facility in Mukran in February 2017, Wasco has been intensively engaged in preparing for the start of production. Following factory optimisation and strict prequalifying tests, the company has now given the green light for production. Some 250 Wasco employees are engaged in concrete weight coating and logistics support in Mukran, where a portion of the finished pipes will be kept at an interim storage facility. The remainder of the finished pipes will be transported for storage in the Swedish port of Karlshamn. When construction begins in 2018, the pipes will be transported by the shortest route possible to the pipelaying vessels. In addition to Mukran, Germany, and Karlshamn, Sweden, Wasco is also using the Finnish ports of Kotka and Hanko as logistics hubs. Concrete weight coating already began in Kotka at the end of March this year. With this latest news, the Nord Stream 2 project continues to move forward on schedule.